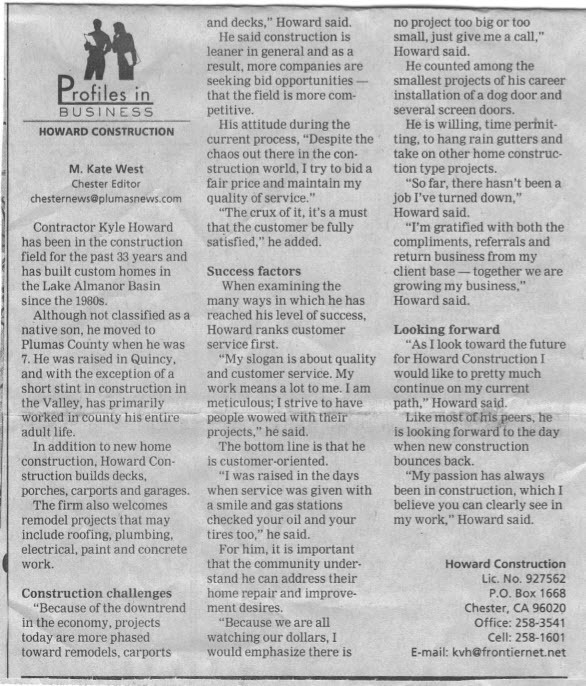 Howard Construction is a locally owned & operated full service Construction Company. Owner, Kyle Howard, has been in the construction field since 1978, building custom homes and other structures in the Lake Almanor Basin since the 1980s. With that experience, Howard Construction offers a wide variety of construction services to fit each customers’ individual needs. We build everything from new homes to decks, porches, carports and garages. We will also gladly do your remodel projects including roofing, plumbing, electrical, painting, and concrete work. Jobs big or small, we do it all. While we would sympathize with you in the event your home is damaged by snow, water or fire, we can respond immediately, mitigating further damage. We have worked with numerous insurance companies helping customers navigate that process as well, in order to start your repair work and get your home restored as soon as possible. Howard Construction ranks customer service first. Our work means everything to us. We are meticulous and strive for perfection. 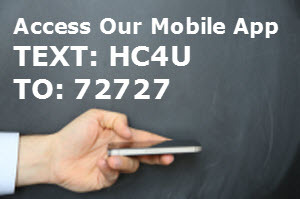 We want our customers to be astounded by our service as well as the work we have performed. We are passionate about construction which clearly shows in our work throughout your project. We take pride in professionalism, quality work and customer satisfaction at a competitive price while maintaining superior service. We are full time, full service, and four seasons. 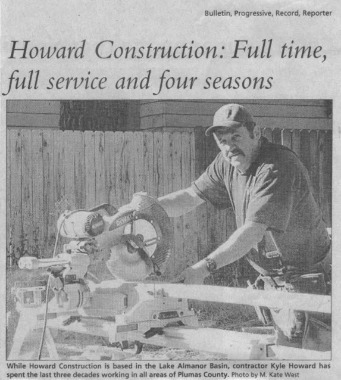 Howard Construction goes by the old school of thought, “the customer is number one,” so satisfied, repeat customers are commonplace.